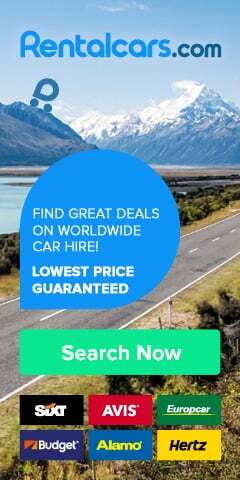 With so many beautiful places in the Algarve (home to some of the most amazing beaches in Europe) as well as the sunny climes, making Portugal your next holiday destination is almost a no-brainer. 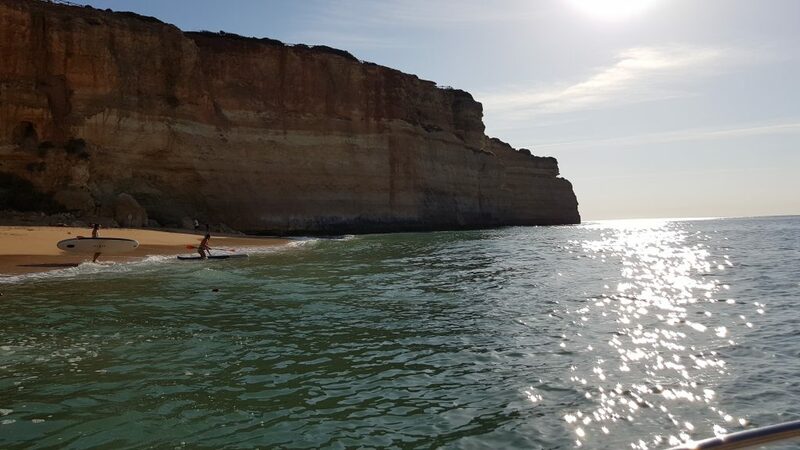 However, if you need more reasons to visit the Algarve – other than its vast array of beaches, low prices and the bright blue skies with sunshine – then the amazing coastal landscape of the Algarve will do it. 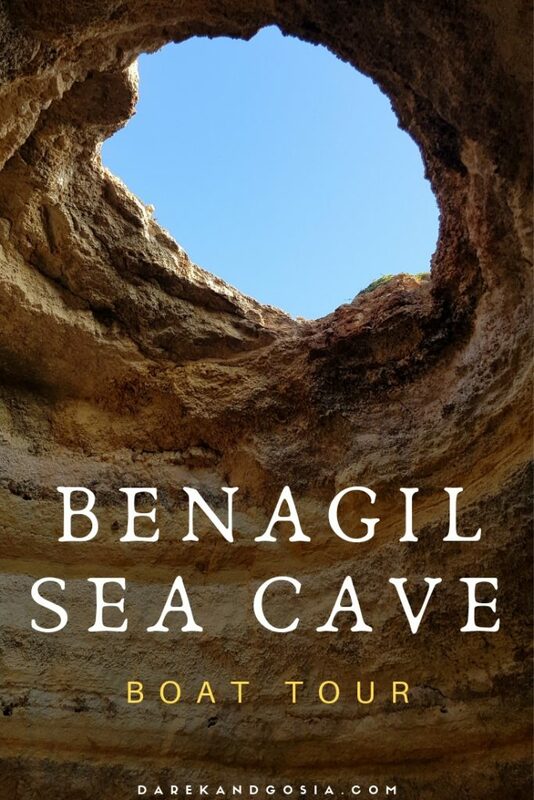 In particular, Benagil Sea Cave is a must-visit destination. Praia de Benagil, which is the beach of the village of Benagil is a charming, family-friendly beach. With soft sands, gently sloping waters and an array of beach activities it is the perfect place for a relaxing day. Surrounding the beach of Benagil is a series of sea caves. 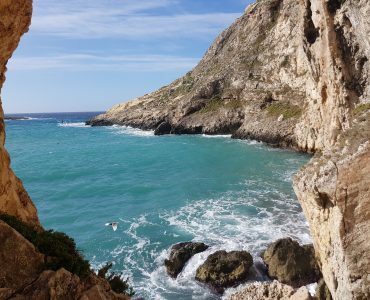 The limestone cliffs have, over time, been hollowed out by the Atlantic Ocean to form a network of intricate and fascinating caves. None more interesting than Benagil sea cave. 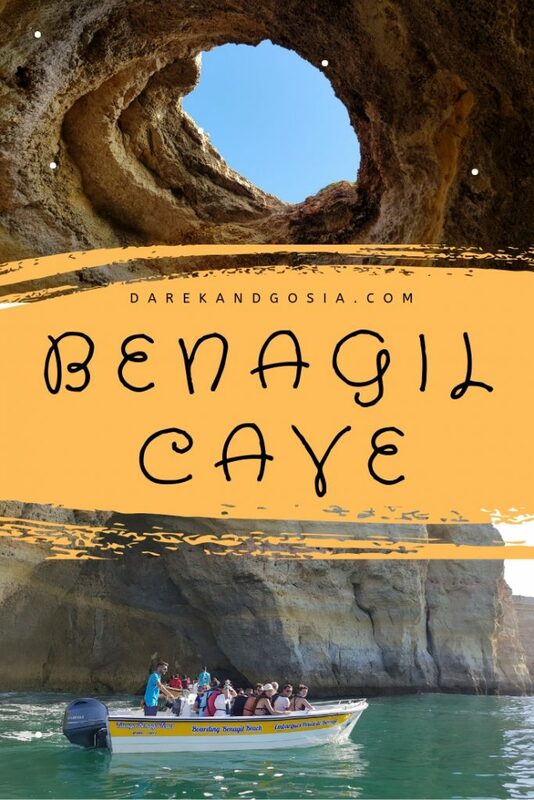 What is Benagil Sea Cave? Benagil Sea Cave, known in Portuguese as Algar de Benagil, is a vast circular cave that can only be accessed via the sea. Many boat tours, stand-up paddle boarders and kayakers can access the cave during low tide. While it is forbidden to disembark inside the cave, many kayakers and swimmers do so. 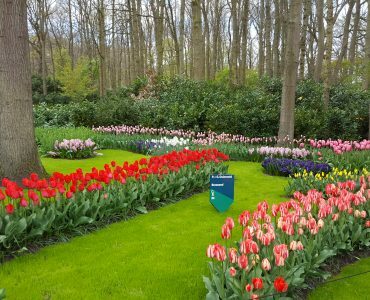 Most boat tours will not allow disembarkation. 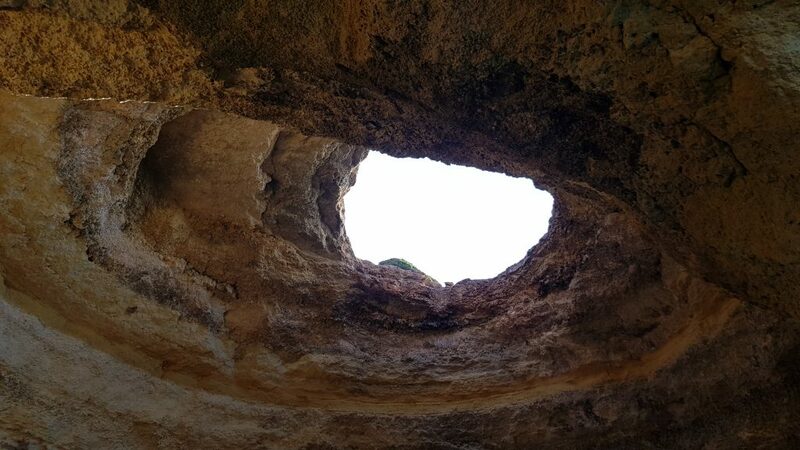 While you may not be able to get onto the beach in the cave, you can enjoy a beautiful and mesmerising light into the cave, thanks to the collapse of part of the cave’s vault. 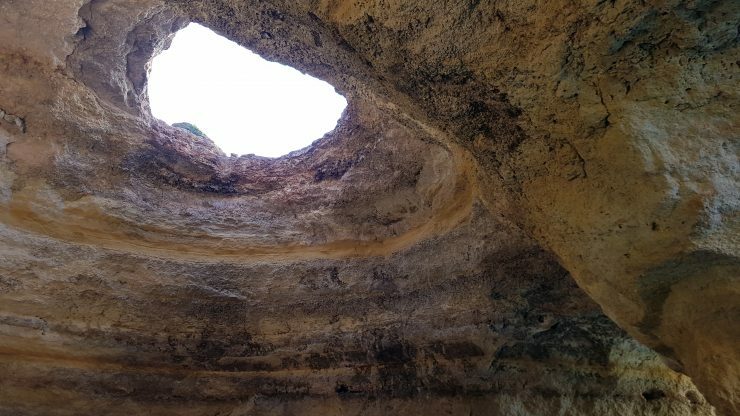 Now the cave has a skylight and visitors can look down on the cave from the cliffs above or marvel at the beautiful colours that the light creates with the water. 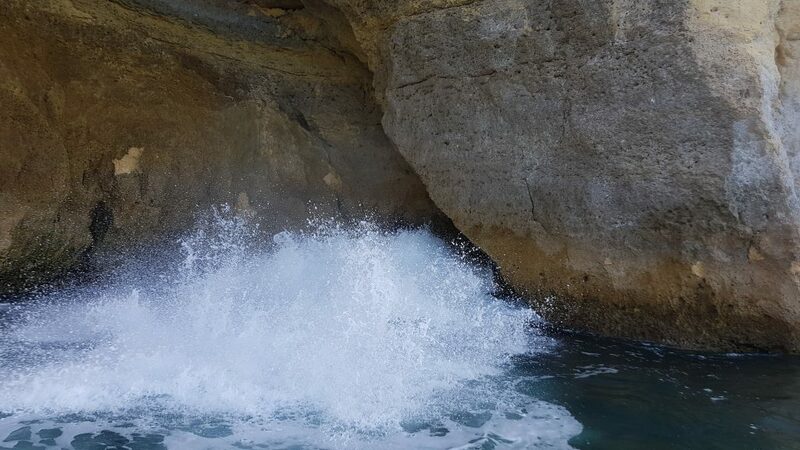 The light, gently lapping waters of the ocean and the incredible structure all add to the beauty and marvel of the Benagil sea cave; a place not to be missed. How to get to Benagil Cave Portugal? While Benagil itself is a small village, there are many large cities and towns nearby. Lagoa, Carvoeiro and Albufeira are close by and are popular holiday destinations. From these locations, it will take around 20-minutes to get to the beach by car. Bigger towns such as Portimão and Lagos are also within an hour’s drive of Benagil too. 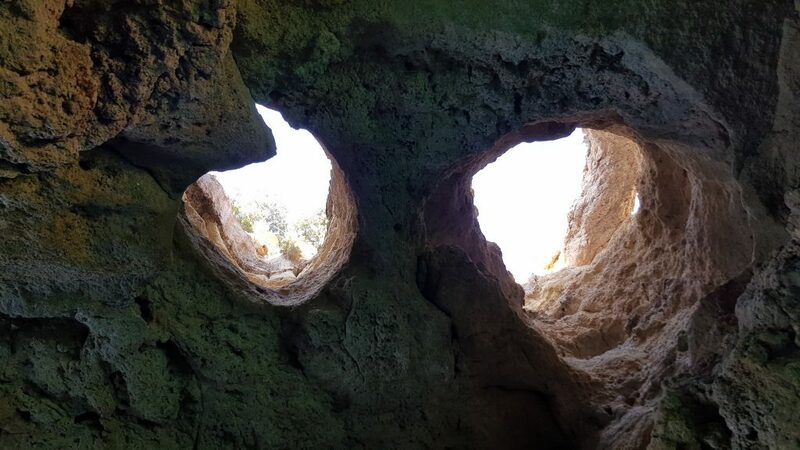 If you want to spend the day on Benagil beach, then thereare several ways that you can see the caves. Swimming – Strong swimmers are able to swim to the cave. The length of the swim is around 200m. However, the currents can be strong and can change quickly. Swimming is not recommended, especially with the number of boats that visit the cave, but you’ll see several people attempting the swim. Kayak/Paddleboard – An excellent way to see the cave on your own terms is to rent a kayak or paddleboard from the companies on the beach. Typically, you can rent one or two person kayaks and large paddleboards too. You will rent these for either 30 minutes or by the hour. An hour is plenty to get to the cave and come back. You may even have time to explore further along the coast too. 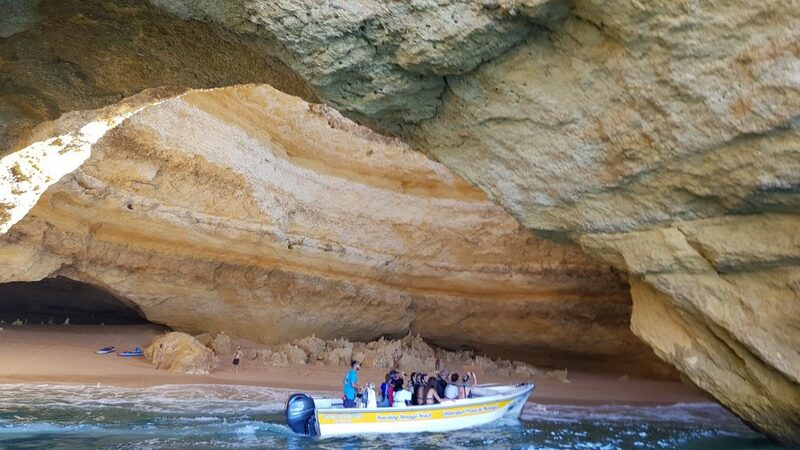 Boat tour – As well as kayak rentals, there are several boats on Benagil beach that offer tours of the cave and the nearby coastline. 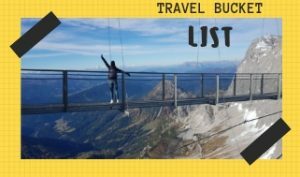 These are entertaining and interesting trips and well worth the money to see the cave. When choosing a boat tour, bear in mind the size of the boat. Smaller boats are best if you want to go all the way into the cave. Large boats will usually only take you to the entrance of the cave. 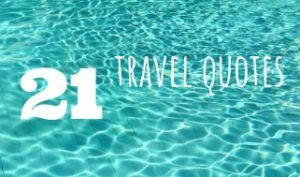 How long is a Boat Trip to Algar de Benagil? Boat trips can last anywhere between 30 minutes and three hours. Dolphins are a common sight across the Algarve coast, so for nature lovers, a longer boat trip will incorporate dolphin spotting too. Make sure to choose a registered boat company for your tour. This will ensure the safety regulations are adhered to. 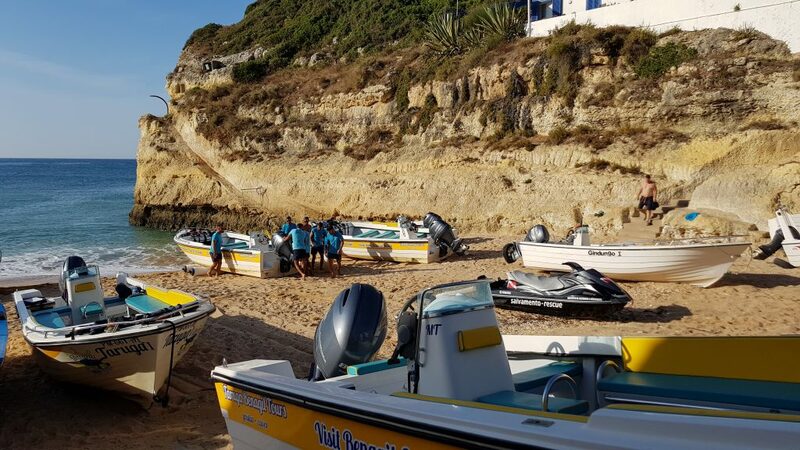 They will also take the appropriate care if they spot protected species of dolphins, which is extremely important for the preservation of marine life in Portugal. What else do you see during boat trip to Benagil Cave? 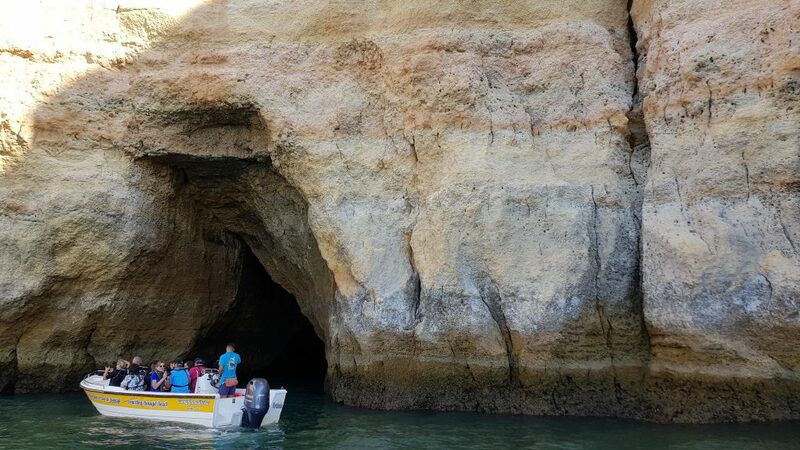 It is worth to say that yes, that the Benagil Cave Boat Trip is all about the Algar de Benagil but you will see much more! There are a few other amazing caves which you will visit during the tour. 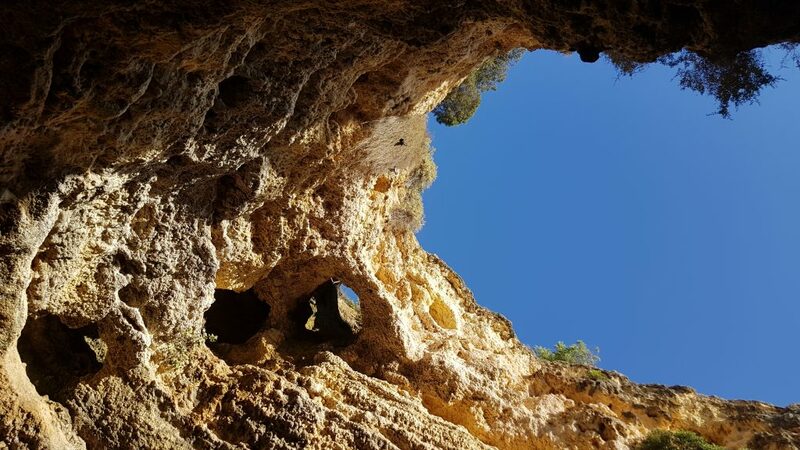 Is it worth to visit Benagil Cave Portugal? 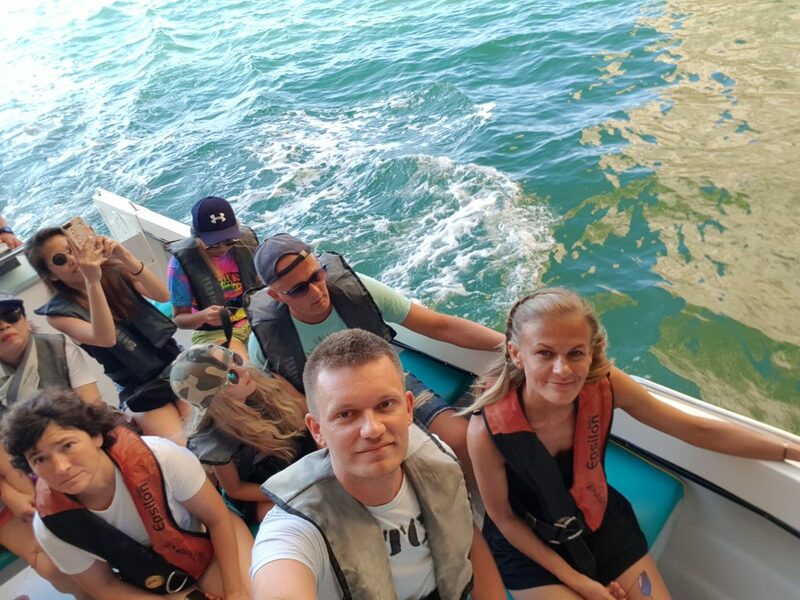 Typically, a 2-3-hour boat trip will cost between €30-€40 per person, well worth the money to see beautiful scenery and wildlife too. So, if you want to see beautiful azure waters, stunning scenery and have a fantastic day out, then make sure Benagil is on your travel list. 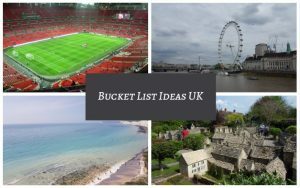 It really is no surprise that many travellers and publications call it the most beautiful place in the world, as well as being a romantic hotspot for the perfect date! 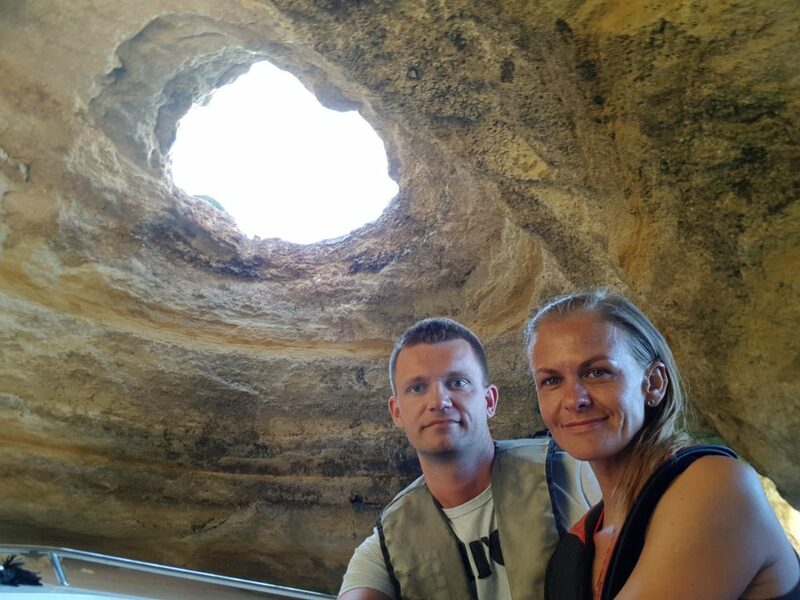 We LOVED Benagil Cave Portugal! And we know you will love the Algar de Benagil too! 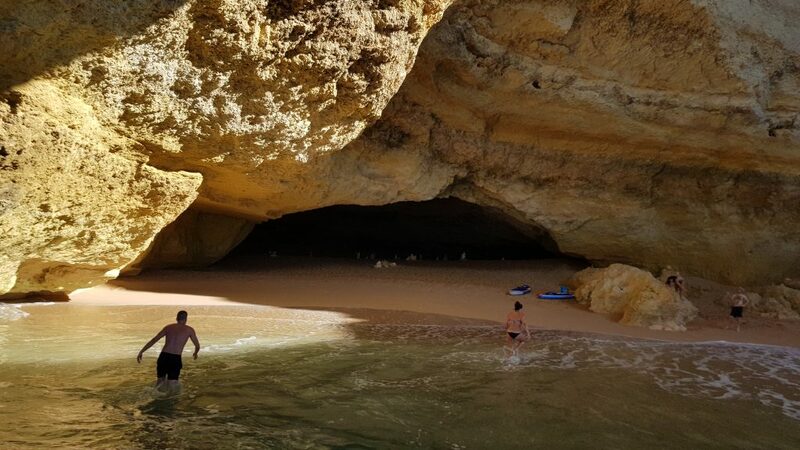 🙂 If you are planning a holiday in Algarve, one of the most romantic destinations in Europe, make sure you add Benagil Cave to your to-do list!